For more information, go to the News Page and click on the story "Duquesne Seeks Craft Brewers". The City of Duquesne created the Redevelopment Authority of the City of Duquesne (RACD) in 1996 under the Urban Redevelopment Law. The Urban Redevelopment Law provides for the creation of authorities for the public purposes of acquiring blighted properties to hold or dispose of them so that they may become available for redevelopment. In addition, redevelopment authorities may undertake other activities to promote development. The RACD is a public authority and is comprised of board members appointed by the City. Current Board Members are as follows: David Bires, Chairman; Elwood Martin, Vice Chairman; Beth Kracinovsky, Treasurer; and Idella Martin. The RACD has been active in property acquisition and disposition of vacant properties in the City of Duquesne. To date, RACD has acquired and sold approximately 125 properties, clearing liens and encumbrances and returning these properties to the active tax roles. Purchasers of properties include commercial businesses for expansion, developers of houses that have been fully rehabilitated, residential property owners who have expanded their homes, built decks and garages and improved side yards. Tax Increment Financing is a development tool RACD has utilized to promote development in the City. The current Tax Increment Financing District is at the RIDC Riverplace-The City Center of Duquesne where industrial redevelopment is taking place. Tax Increment Financing is a creative financing mechanism to promote building and property development and job creation. The RACD works in partnership with the City of Duquesne and the City's non-profit development corporation, the Duquesne Business Advisory Corporation (DBAC) to promote community revitalization in the City of Duquesne. The Duquesne: Center of the City Report, completed in July 2008, was a product of the partnership among the three entities. The RACD, funded by the Pennsylvania Department of Community and Economic Development, solicited consulting services for production of a redevelopment plan for the core area of the Duquesne CBD, focused on the Grant Avenue and Duquesne Shopping Plaza area of the city. This study area represents the key commercial district of the city, the signature gateway into the city and RIDC park, and a high visibility location for redevelopment. The experienced team of Impact Economics, LP and Perkins Eastman was selected to conduct all aspects of the study and complete a revitalization plan. The project team worked under the guidance of a steering committee comprising key Duquesne leaders and stakeholders including representatives from the City, DBAC and RACD. The resulting plan prioritizes redevelopment strategies and actions based on an assessment of community assets and opportunities. It outlines an ambitious but realistic program designed to spur public and private investment in the revitalization of the Duquesne Center of the City (CBD) and the improvement of Duquesne's "design quality and sense of place". Click here to download the plan. In 2011 the "Pipeline Coaster" section of the Great Allegheny Passage connecting Duquesne with The Waterfront at Whitaker/Munhall was opened. The 3-mile section is called the "Pipeline Coaster" as it follows an old United States Steel gas pipeline and passes near the roller coasters at Kennywood Park. After this section was completed, the one-mile section through Sandcastle was completed and now the 150-mile Great Allegheny Passage connects Pittsburgh with Cumberland, MD. 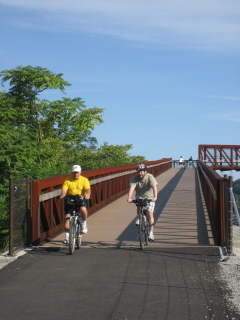 For more information on the trail, go to http://www.gaptrail.org/. October 2, 2009-Ribbon Cutting for Duquesne Segment of Great Allegheny Passage. The ribbon-cutting for the Duquesne portion of the trail of the Great Allegheny Passage was held on Friday, October 2nd in Duquesne. At the event, trail officials opened a 60-foot tunnel on the RIDC City Center of Duquesne site that allows cyclists and hikers to use the Riverton Bridge across the Monongahela River into McKeesport. When completed, the Great Allegheny Passage Trail will run from Pittsburgh to Washington, D.C.
Pictured here, from left to right are: Allegheny County Councilman Bob Macey, Allegheny County Executive Dan Onorato, Mayor Phil Krivacek, and Linda Boxx and Hannah Hardy with the Trail Town Program. The Duquesne Business Advisory Corporation announces a new low interest loan program is available for commercial building owners in the City of Duquesne - the Building Investment Loan Program. This may be used to renovate commercial buildings for activities like roofing, cleaning, pointing and facde work. It may be used in conjunction with other Enterprise Zone incentives available in the City of Duquesne. Click here for guidelines for the program. Call the office at 412-469-8744 for more information. Thinking about replacing your sidewalk...matching grant funds are available to assist. The maximum grant is $500. For details call us at 412-469-8744. Click here to download an application. This program is sponsored by the Duquesne Business Advisory Corporation in conjunction with the City of Duquesne.